Jiachen Zhang reviews Nothing Ever Dies: Vietnam and the Memory of War by Viet Thanh Nguyen for the British Association for American Studies. Viet Thanh Nguyen, Nothing Ever Dies: Vietnam and the Memory of War, Harvard University Press, 2016. 384 pgs. 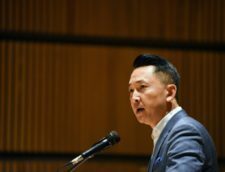 Viet Thanh Nguyen, a professor in American Studies who won a Pulitzer-Prize for his book, The Sympathizer (2015), opens up his 2016 treatise on memory and war with a powerful sentence: ‘All wars are fought twice, the first time on the battlefield, the second time in memory’ (4). 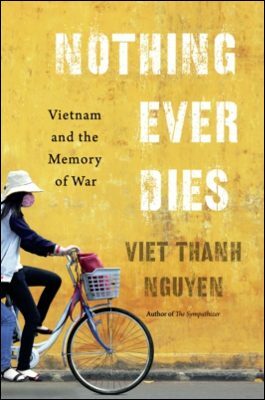 In Nothing Ever Dies, Nguyen deals with the extensive ways of knowing and remembering wars in general, and delineates the identity crisis that arises from grappling with what some name the Vietnam War and what others would call the American War in Vietnam. The naming of the war itself arguably casts shadow upon one aspect of the selective memory in remembering the violence in South Asia: encouraging Vietnamese people to think of themselves as victims of foreign aggression and facilitating their amnesia about what they did to one another or to other countries such as Cambodia and Laos. The author regards such naming as the epitome of what he defines as the industrialisation of memory. Throughout the book, Nguyen observes how both Vietnam and the US fashion war memories in various memory projects which take the forms of art, literature, cinema, photography, memorials, graveyards and museums. He suggests that the excessive violence of the war and the affective impact on contemporary individuals exceed the national boundaries and defy the war’s official dates, which have been identified by the naming of the war. Rather than limiting his vision to a simplified reading of the nationalist representation of war memories, the author moves further to complicate the process in which the war victims and witnesses relive and reinterpret the war’s memory. By recalling the weak, subjected and forgotten people and experiences, and their aspirations to form alternative memories and memorialisation, argues Nguyen, we can oppose the dominant memory of the war, and create spaces for reimagining and remembering the war differently. This gives birth to what Nguyen calls ‘a just memory.’ Thus the project forces the readers to think anew about the Vietnam War and ponder questions of memory, representation and reconciliation. In the first part of the book, which discusses the ethics of war memory, Nguyen records his experiences of visiting the war memory sites established in Vietnam and the US. More specifically, he focuses the embodiments that are present and absent in these sites’ commemoration and their functions in displaying the memory’s humanity (the salute of the fallen soldiers, the value of peace) and inhumanity (the death of the innocent people, the violence and cruelty of the war). In his visit to various graveyards commemorating the war heroes in Vietnam, Nguyen argues that these sites are established to remember the humanity of the winning party’s own side. The geographical location and the national affinity of the graveyards facilitate the remembering but cannot shadow the sites’ sanctioned ambitions of such memorialisation that exclude the remembrance of those deceased and exiled people who fought for the losing side. In a few memorials, however, the process of commemoration is blended into the ethical mode of remembering one’s own as well as that of remembering others. The Vietnam Veterans Memorial in Washington is one such case. The visitors honour the American war dead, help heal the plagued morality and reputation of American soldiers and recast the war as a heroic and patriotic endeavour. The Memorial’s black wall, argues Nguyen, captures how the dead belong to the living as their own but are also irrevocably other: the otherness — the mystery and terror of the dead embodied by the dead — is inevitably shared with the living. Such remembering of oneself, and its evocation of otherness, forms unique ways of recognising self and healing wounds of the war, yet encourages us to overlook our collective ability to commit crimes of genocide and atrocity. Nguyen then warns that the failure to recognise our capacity to victimise would not prevent the victimisation carried out on our behalf, or which we do ourselves. That makes the S-21 Museum in Tuol Sleng a valuable and necessary site to remember and never forget our humanity and other’s inhumanity, thus affirming a just ethics of recognition that confronts the totality around us. The difficulty of ethical recognition in an unequal conflict is compounded by the more powerful culture’s ability to create designated memories and understandings about the war. Nguyen suggests that the US industry of memory includes the material and ideological forces that determine how and why memories are produced and circulated, and who has access to, and control of, the memories. For instance, the helicopters in Francis Ford Coppola’s Apocalypse Now (1979) become a motif in American movies on wars and connote sexual symbols to personify America as both terrifying and seductive in Nguyen’s reading. The Vietnamese characters, by contrast, are often portrayed as rebellious, savages and refugees, who serve as the collective object of masculine desire, hatred and fear for the American war machines. In this light, Nothing Ever Diespoints out the pervasiveness of industrialised memory in refusing collective memory in the inhumanities of the other from being recognised. In order to construct effective memories for the humanities and inhumanities of the war, Nguyen further discusses the aesthetics and ethics of writers who write about wars. These war literatures, especially those written by ethnic minorities, seem to be the perfect translator to show the public about wars through their common use of victimised and minority voices. For the majority readers, who can assume their own humanity and universality, these stories about others are highly needed to recognise the humanities of others. 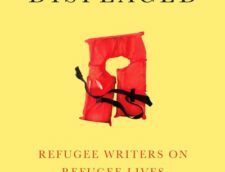 Nguyen seeks to challenge this dominant positioning of minority writers as native informant and asserts that a “true” war literature should insist on the dreadful knowledge of the inhumanity that exists with the human. 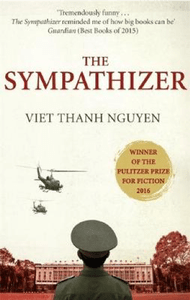 His own novel, The Sympathizer, becomes an exemplary art of work to confirm this literary ambition. 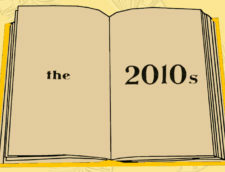 The novel’s intended reader is an unnamed and faceless Communist figure; Moreover, its exposure of the violence within the communities of Americans, Vietnamese refugees, socialist Vietnamese revolutionaries and bureaucrats ultimately challenges the dominant notion of identity in that a “true” war ‘radically challenges identity, from the soldier who must confront himself as well as the enemy on the battlefield to the civilian who discovers she is less than human when she becomes a refugee’ (245). To construct just war memories that deny simplified ways of remembering in the form of humanities amounts to the central theme of Nothing Ever Dies. In addition to various forms of the memory projects, the book itself might tell us another effective way to present the humanities and inhumanities from multiple perspectives. Nguyen’s visits to those unvisited graveyards and monuments, provocative meditation over the torture scenes in the death camp and convincing analysis on cinematic representation add to the significance in approaching the forgotten war memories that are ‘impossible to forget but difficult to remember’ (19) in intersectional and individualistic manners.